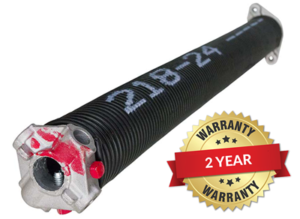 Looking For Garage Door Spring Repair Pricing? One of the most common garage door repairs is spring Replacement. Garage door springs last about 7-9 years on average, which is about 10,000 cycles (opening/closing) at about 4 times per day. If your garage door needs repair, give us a call 678.490.8899, we can help. Tear down, rebuild and balance torsion/extension spring assembly. Stretch springs, lubricate bearings, slip drums, level door, and service on torsion. Remove extension springs reset tension, and track cable (reinstall un-damaged safety cable or install purchased safety cable is required for your safety). Warranty: 2 year broken spring, 90 days labor. Tear down, rebuild and balance torsion assembly. Stretch springs, lubricate bearings, slip drums, level door, and service. Warranty: 5 year broken spring and 2 year broken spring labor. No labor warranty if bad parts are not replaced. Warranty: 10 year broken spring; 5 year broken spring labor. Warranty: Lifetime broken spring, 10 year broken spring labor, Free 2-year Spring Retention. The above offers cannot be used with any other offers, promotions or sales. No additional discounts will be given. *$150 tear down and rebuild labor is for standard residential doors only. Please call us at 678.490.8899 for a quote on non-standard door service. If you are not sure whether you have a standard or non-standard door give us a call, we can walk through it with you.